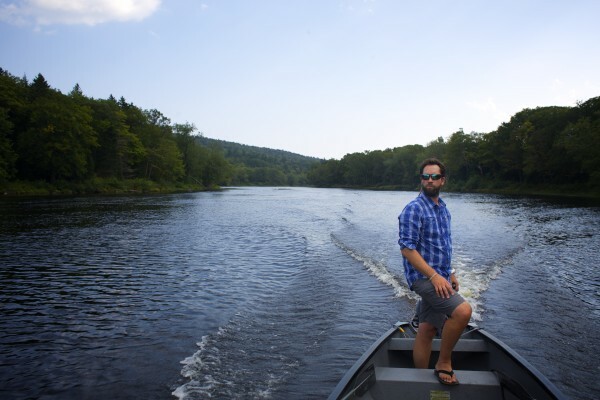 Lucas St. Clair steers a square-stern canoe on the East Branch of the Penobscot River into an area where Elliotsville Plantation Inc. has opened 40,000 acres to hunting and other recreational use. U.S. Sen. Susan Collins’ favorite pollster found in a survey of 500 respondents across the 2nd Congressional District last month that 67 percent favored a proposed 150,000-acre north woods national park and recreation area, officials said Tuesday. Commissioned by leading park proponent Lucas St. Clair and conducted on May 13 and 14, the survey found what Moore Information pollster Hans Kaiser called “wide majority support among a wide cross section of respondents.” That included support from 57 percent of Republicans polled, 77 percent of Democrats and 68 percent of independents, Kaiser wrote in a two-page memo. “Men and women, voters of all ages, conservatives, moderates and liberals are all supportive of the proposal with large majorities in each group favoring it,” Kaiser said in the memo, which St. Clair’s organization released Tuesday. Twenty-five percent opposed the park, according to the results. The telephone poll has a margin of error of 4 percent with a 95 percent confidence level. St. Clair spokesman David Farmer said St. Clair paid Moore Information of Portland, Oregon, for the poll because the firm is well-known as a pollster for Collins and other Republicans. Farmer declined to say how much it cost. Support from Maine’s federal delegation — Collins, U.S. Rep. Bruce Poliquin and U.S. Sen. Angus King — is crucial to the park effort. The delegation received the results last week, Farmer said. Park opponent Bob Meyers, executive director of the Maine Snowmobile Association, dismissed the poll results as part of the “endless stream of mush” St. Clair’s organization is generating in its drive to give the National Park Service lands owned by the family of Roxanne Quimby, St. Clair’s mother, in 2016, the service’s 100th birthday. “They have spent so much money on things of no substance that it is kind of hard to believe any of the things coming out of them anymore,” Meyers said. “I don’t know if they are doing this to soften the blow if the votes in East Millinocket and Medway blow up on them later this month to try and get some cover, but it is obvious that they are spending hundreds of thousand of dollars on something that isn’t even defined, other than to say that it will all be addressed in federal legislation. The proposal includes a 75,000-acre national park and a 75,000-acre recreation area. Proponents said a park would generate 400 to 1,000 jobs, be maintained by $40 million in private endowments, diversify a Katahdin region economy devastated by the closure of two paper mills, be heavily controlled by local leaders and coexist with existing industries. Opponents have said they fear a park would bring more federal authority into Maine, cramp the state’s forest products industries with tighter air-quality restrictions, generate only low-paying jobs, restrict sportsmen’s access to the Katahdin region and morph into a 3.2-million-acre plan offered in the 1990s. They also express skepticism about the positive economic benefits that proponents say the park would create, call the plan vague and doubt that the land is attractive enough for a park. Public since 2012, the proposal gained new life when Millinocket officials revealed on Feb. 7 that King had sought their requirements of a park. Part of the local response to the letter are the East Millinocket and Medway nonbinding referendums on June 25 and June 23, respectively. Millinocket Town Councilor Jimmy Busque, a park opponent, said he discounts the survey because the question is misleading. Farmer has described 150,000 acres as a goal. The federal legislation required for a park’s creation would reflect the acreage the family owns, he said. The poll only found less than majority support among residents who described themselves as “somewhat” or “very” conservative. Conservative voters who were “slightly negative” about the proposal held at 43 percent supporting vs. 48 percent opposing, according to the results. About 35 percent of all respondents said they were less likely to support the park when a key opponents’ argument was posed: “Mainers already have access to the land and designating it a national park would only impose restrictions that limit their current access,” Kaiser wrote. According to the poll results, 71 percent of Portland-Auburn television market residents surveyed approved of the park as described, while 19 percent opposed. Sixty-three percent of Bangor-area TV market residents approved against 30 percent opposed. In the Presque Isle market, 79 percent approved and 16 percent opposed. The strongest support came from people who identified themselves as ages 18-34, with 84 percent approving and 7 percent opposing. Correction: A previous version of this story incorrectly stated that U.S. Sen. Angus King, I-Maine, had sought Millinocket officials’ requirements of a park in a letter.